Basic concepts are essential building blocks of language. When children are delayed in acquiring these words, it can make simple tasks challenging and frustrating for them. We know frequent and consistent repetition of information is always best when teaching a new skill. So why not do it when we teach basic concepts? 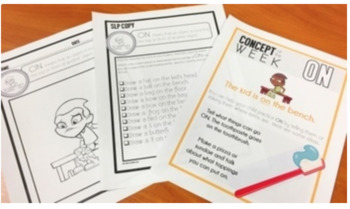 Now you can have a resource that allows you to target specific concepts all week! WHY THE 'CONCEPT OF THE WEEK'? ✏ Research Based. This resource is supported by research regarding child language development and acquisition of basic concepts. This research allowed for the creation of a resource that progresses through a heiracrchy of levels while offering frequent opportunites to see a concept used. ✏ Easy to teach. You won't need to spend hours learning a program or process. Simply follow the easy to read instructions the included to get your students on their way to developing their knowledge of basic concepts. ✔ PARENT HANDOUT : Parent hand out with two activity suggestions for home to promote carryover. ✔ INFORMATIVE HANDOUT: Handout for parents explaining basic concepts and the activities. 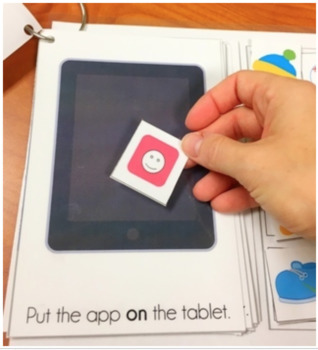 ✔ INTERACTIVE BOOK: An interactive book for each concept. ✔ FOLLOWING DIRECTIONS: A follow directions drawing page with included directions to increase the intensity level for the student and take data. * Now with CONCEPT OF THE WEEK Door Hangers! ♥Note: All interactive books use the same images. This is done so that students must listen to, and focus on, the concept they are targeting. When students are shown the same image they are likely to assume they are addressing the same task/concept as previously instructed on , rather than attending to the concept being addressed. 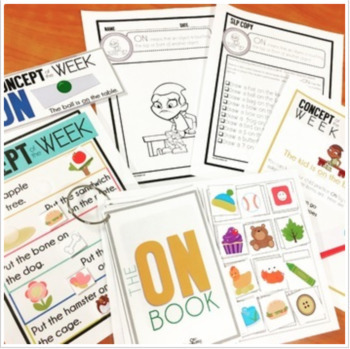 By using the same visuals, it can keep students at the ready to listen to the concept they are working and reinforce students to listen to all information. ☞ This resource would best service students in Pre-K through 2nd grade. ✋Hi! I'm Maureen and it's awesome to meet you. I am an experienced and ASHA certified Speech-Language Pathologist as well as a Certified Autism Specialist. Being a speaker at the American and Hearing Association Convention, as well as at various state conventions, over the years has been truly inspiring and helped to fuel my passion for supporting others. ✍I have been creating resources since 2012 to help other professionals support their students. I believe in creating thoughtful and thorough materials to help you shine; Innovative and supportive creations to help you love what you do! 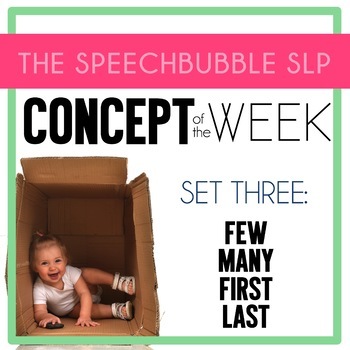 ⭐If you have any questions about this resource, or if you simply like to 'talk speech' with me, send me an email at thespeechbubbleslp@gmail.com.